What snorkeling adventure would be complete without eyeballing a turtle. These are green sea turtles, honu in Hawaiian. They will cruise through the blue waters to visit the various cleaning stations made available by the local reef fish. Then ride the waves into the rocky shoreline looking for a decent patch of algae to munch on. It's really interesting watching them navigate the waves and tidal surges to keep their beaks in position to make that strike at their salad. Cruising above the coral on the lookout for a good salad. It is fairly common to see a turtle along the Hawaiian coast. 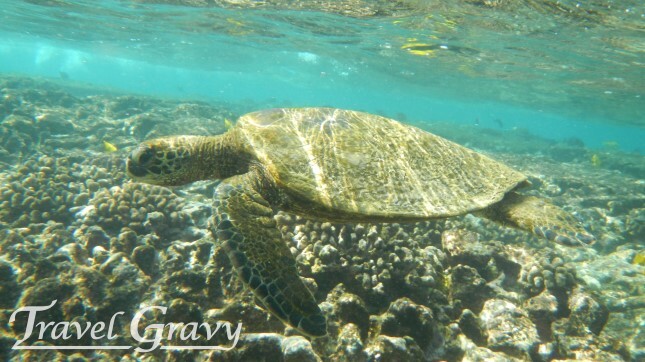 They don't hesitate to occupy the same snorkeling spot with the tourist and locals alike. Today this young turtle, in the video below, decided to follow us or we inadvertently picked the same snorkeling path. We went from the Two Step entry point around to the north point of the bay and back. The turtle would show up along our side periodically as if to check out if we had found anything good. Most of the time one turtle looks like all the others, but our snorkel buddy had a small hole in the side of his shell. A day of turtle watching. He watched us as we watched him. We started out the day by going to Keoneele Cove by the Place of Refuge on the Big Island of Hawaii. Because of the dangerously rough surf, we couldn't get in the water. We've never seen it like that. There were three people fishing at Two Step (the place where the divers and snorkelers enter the water). The few people who were there were sitting on the lava, and no one was in the water. Went to two other coves, and they were the same. After 4 p.m. we went to Kahalu'u and, although not as clear as usual, we were able to snorkel. We had a brief encounter with a spotted eagle ray. He was about 4 feet in width and maybe 7 or 8 feet long, nose to tail. Shallow water and close to the beach. The water was murky at about 4:30 p.m., and the sky was hazy when we saw the ray. We don't add any filters to the video, so you see it like we saw it. You can upgrade the size and quality of the YouTube video by clicking the options on the bottom right when it is playing. We know better than to go without checking first, but we'd always had such good luck snorkeling there. The National Weather Service Weather Forecast Office for Hawaii, keeps a listing of Active Watches and Warnings for the Islands (plus included phone numbers to call if you are away from the internet and want to check on weather conditions). There is also a Hawaiian Coastal Waters Forecast that I check. I wanted to share what I felt as the dolphins were swimming around me, disappearing into the blue depth then reappearing. I felt immense gratitude and peaceful joy. It was the satisfaction of a journey completed. It seemed so little to say about an event so special, that I knew I had to share the journey to explain the feeling. Mother and child swimming to me and then catching up with their pod. Or to see the full 5-minute dolphin video click here. I’ve been in love with water my whole life. I often played in the tub until my skin was pruney and the water cold. It was the early 60s in Texas, and most homes, schools, businesses, and churches weren’t air-conditioned; so for most of the year it took a long time for warm bath water to become cold bath water. Mom or Dad would check-in on me, and if my fingers were too wrinkled or my teeth were chattering, I’d be forced to leave the tub. When I was around three years old, I was taking a bath and watched a spider slowly, very slowly, crawl out of the overflow drain; eight, black, spindly legs appearing in high contrast against the white porcelain tub. I stayed motionless and soundless just staring at the spider; then screamed for help. Was I too little to get out of the tub by myself, or had I never done it without help? Was I following some family rule, or was I too frightened? I don't know why I didn't jump out of the tub. But then and there began my fear of spiders, and it was years before I would again enjoy a bath alone. The summer I was six, we moved from the home my parents rented when they first married, to the first and last home they would ever buy. The move took us across the street and four houses down, yet it was a whole new, exciting world; because there was a swimming pool! I can’t remember a time when I couldn't swim. We moved to our new house, and I could dog-paddle; but it was much easier to swim underwater than on top of it. Mom’s rule was we could not swim without an adult present. Ours was the only house on the block with a pool, and like I said, no one had air conditioning, so there were plenty of neighborhood moms willing to swim with their kids, and it wasn't long before I could swim just as well on top of the water as under it. When there wasn't a mom available, the kids on the block would play in our front yards and street or in the two-block-long creek area that ran behind our houses. This was long before sunscreen, and the trees that shaded the deep end of the pool, the front yard, and the creek kept my fair, freckled skin from being red all summer. When I started school that September, my mother “closed the pool,” and it didn't reopen until the school year ended. I counted the next twelve years by the summer-brakes. One summer my grandparents ran the municipal pool in Eunice, New Mexico. My aunt and uncle were lifeguards, and that is where I first jumped off a high dive. I dared myself to do so after days of watching others jump. The line was long, and as I waited behind other wet and dripping children, there was plenty of time to change my mind. In a line you go forward. At the bottom of a ladder you climb. At the end of the diving board there seemed to be no other option but to jump, yet my mind raced to find one. It was frightening just standing there at the end of the board. I decided I could face the embarrassment of climbing back down the ladder, but being in the water seemed safer than being on the diving board, so I jumped. I never found jumping off the high dive, nor heights, nor ladders fun. The diving board at home was a different story. "How far," "how high," and "how big a splash" were all games I played by myself and with others. My husband Bill loves the water, too. He’d had a swimming pool when he lived in Phoenix, Arizona, and he swam in the bays and ocean when he lived in Ft. Lauderdale, Florida. The summer before he was in second grade, his family moved into his grandparents’ home, and they added a pool. Bill, who I wouldn't meet for another 10 years, played in the creek behind his house just two miles from me. Oak Cliff, Texas, where we lived, was riddled with creeks and springs until people tamed all but the largest of them by shunting them off into culverts and drains. Progress had taken countryside, which reminded early settlers of the wine country in France, and choked it into a concrete-gridded landscape. Unlike my parents, Bill’s parents kept their pool “open” year round. If you could tolerate the cold, you were welcome to swim. We started dating in November of our senior year of high school, and we were swimming together by March. The only other time I’d been swimming in March, was in the Gulf of Mexico, in Galveston, Texas on my first trip to the ocean. Bill impressed me by how far he could throw his nieces in the pool, what a strong swimmer he was, and how many laps underwater he could swim. It was a surprisingly-effective courting method. He soon figured out that I liked water as much as he did, and he took me swimming in Lake Grandbury and jumping off the cliffs at Lake Whitney. Jumping was terrifying, but I did it because there was nothing I couldn't do, just things I hadn't tried. He took me to Mountain View Lake where no one swam; they only fished and parked, and we didn't fish. For both of us, all the best parties were pool parties. Our wedding invitations included a note telling our guests to bring a swimsuit. I told Bill that I would never live north of the Red River where it forms part of the border between Texas and Oklahoma. I didn't like swimming in cold water, and to "not swim" was not an option. Lake Texoma was about as far north as I could stand it. 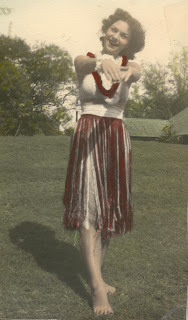 In the early years of our marriage, Bill and I lived in the Dallas Metroplex. We live in a series of apartments and condos with pools, but the majority of those early years were spent in a duplex and a couple of houses all without pools. We were so busy (school, work, a baby) that we swam at his parents’ only rarely, and never at my parents' because their pool was now permanently closed. 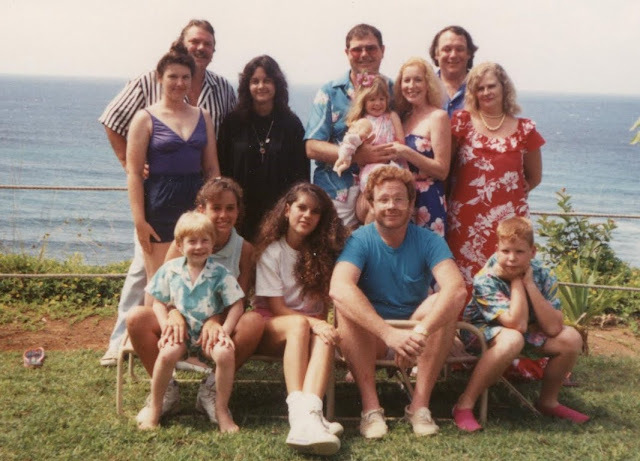 When our son Eric was five and we were 30, Bill’s mother, Carol, took the family to Kauai. Carol's father had run the USO there, and it was there she met her husband when she was a senior in high school and he was a Marine. We snorkeled for the first time off the north shore of Kauai at Tunnels Beach, and we fell in love with snorkeling. ﻿﻿﻿﻿﻿﻿﻿Just a few months later, we were working on Bill’s resume, and planning to send it to every bank in Kauai, when a client company called and offered Bill a job in Austin, Texas. We put away the resumes and two weeks later moved to Lakeway, Texas with our six-year-old son Eric. We swam and snorkeled for the next 11 years in the deep, cool, clear water by the dam at Lake Travis. Bill learned to scuba dive in that lake. We started tubing and snorkeling throughout Texas on the weekends. Our favorites were the Frio, San Marcos, and Comal rivers and parts of the Colorado River. I revised my mantra and told Bill, I saw no reason to ever live north of Lake Travis. We watched the clarity of Lake Travis diminished as the silt and run off from the constant construction clouded the lake and the lawn fertilizers and effluence fed the algae in what I once thought was the prettiest lake in Texas. 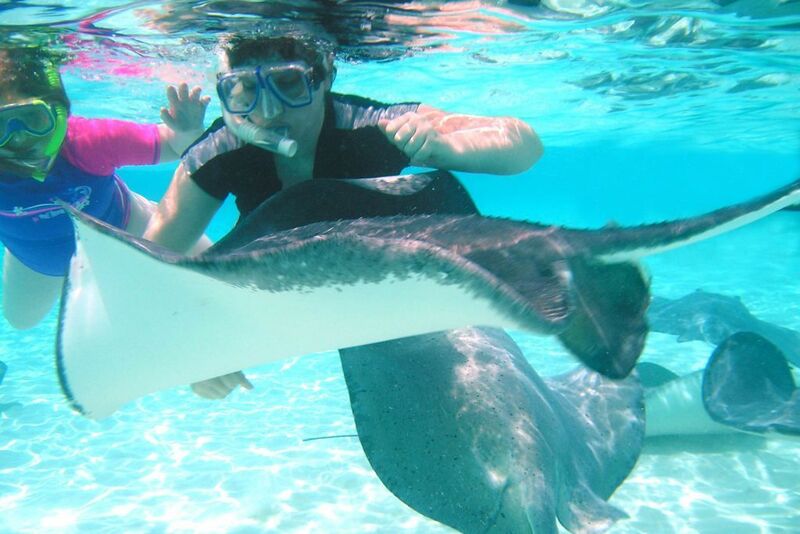 Our favorite vacations were snorkel trips. 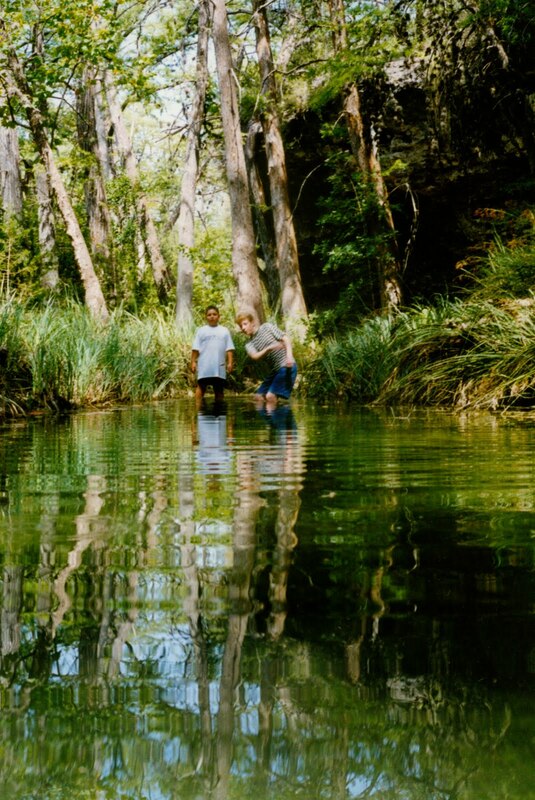 When we bought land to build our home, it was on a crystal-clear, spring-fed creek with a natural pool deep enough to swim and snorkel with sunfish, bluegills, turtles, and an occasional water moccasin. It was there on Lick Creek where I learned how friendly and soft catfish can be. Eric and Bill played tic-tac-toe in the gravel at the bottom of the creek. During those years when we were hand-building our home on the weekends and late summer nights, we would cool off in the natural pool, shaded by limestone cliffs and tall Cyprus trees. Another baby came, and we never finished the house, so we sold it to someone who did. We moved to Bastrop, Texas, while our neighbors on Lick Creek spent many years in courts fighting with upstream developers who were polluting the once-pristine creek. We found Lake Bastrop too murky to snorkel and too hot to be refreshing. The dirty water down stream from Austin and high profile drownings kept us from swimming or snorkeling the Colorado River in Bastrop. The proximity to neighbors discouraged us from putting in a pool. So we found other places to swim. We enjoyed two adventures to Grand Cayman island to swim with stingrays, and a trip to Kauai to swim with turtles. We searched online for a long time for our next home. When we saw it, we walked straight through the house, stood on the back porch, looked at the pool, the trees, and the dry-bed creek and knew we were home. It was easy. I expected to be in that home for the rest of our lives. There were pool parties again, and our son was married there. Our pool was “open” year round. Even in the few cold Texas months, we’d spend evenings watching movies in the hot tub. We still loved to snorkel. Our goal was to find good ocean snorkeling, with a beach access, without having to take a boat or a plane to get there. In June 2011 we drove to La Jolla, California, because we were told it was the best place to snorkel in California. When we got there we found that there were a lot of people swimming for distance, but none without a wetsuit, and no one snorkeling. After two days of watching others swim, we purchased wetsuits. I imagine that the water would have been clear had it not been for all the pieces of seaweed being churned by the waves. I didn't get far from shore before telling Rachel and Bill I was heading back. It was difficult to breathe. I didn't know if that was because of the cold, or if the wet suit was too tight making it difficult to expand my lungs. I unzipped my Neoprene vest. It is much easier to snorkel than to swim, but I stopped snorkeling, because I still felt I couldn't get enough air. I passed within an arm’s reach of a California sea lion in the water. Our eyes met and I thought “Sorry, you’ll just have to swim around me.” Any other time I would have been excited and a little scared to be that close, but I didn't have the energy to be either. Sea lions on the point. It doesn't look as difficult to swim around as I found it. La Jolla, California, 2011. By the time I reached land, one of the lifeguards had come down from his watchtower and was standing on the shore where I was trying to haul myself out of the surf. I’m sure he thought, why doesn't she just stand and walk out of the waves, I know this because he said something to that effect. I couldn't quite hear what he said. It didn't matter, because I just didn't have the strength to do it. When I was finally sitting on the sand, he asked if I was OK. I nodded “Yes,” still unable to breathe. I thought, “You’re crazy if you think there is going to be a next time?” I still don’t know if it was the constricting wetsuit or the cold water that made it almost impossible to breathe; but I have never felt older or closer to dying, and yet I was surprisingly calm the whole time. We drove to San Diego, California where we took a Zodiac inflatable-boat tour to see whales. We didn’t see any, but did see hundreds of dolphins, more than we’d ever seen. The water was much clearer far away from the shore, and we would have loved to get of the boat and into the water with the dolphins, but the water was still too cold, and they wouldn't have let us anyway. In August we drove to Panama City Beach, Florida to hopefully snorkel with free dolphins. On the dolphin-tour boat it became of fruitless tourist game of “There’s one. Quick, jump in the water.” The next day we rented a pontoon boat, so we could stay out longer and therefore increase our odds of seeing dolphin, but we didn’t see any. We drove on to Chrystal River, Florida to swim with manatees. We wrongly assumed that summertime would be the best time to swim with manatees. The best time to see manatees is during the coldest months of the year, when they come to the cold spring water, to get away from the even colder ocean. There were a few manatees who still lingered nearby; but unfortunately not by the cool, clear spring’s area, but in the murky lakes and streams where they faced ever-growing danger of recreational boats hitting them. Because the visibility was so poor, it took courage to get into the water with the manatees, and required a person remain on the boat to guide us toward the manatees, once we were in the water. When I first saw a manatee underwater, I thought it was a rock. The water was so murky that, even when touching the manatee, I couldn't see the nine feet from her tail to her nose. It was disconcerting being in the water with a thousand pound animal that I couldn't see until I was close enough to touch her, even more so knowing Florida has alligators, and my imagination populated the lake with them. As I lightly rested one hand on her warm side, and she continued to calmly eat, my imaginary alligators drifted away, and I was left with the wondrous feeling of floating in the water with the manatee mother and her calf. What warm, peaceful creatures they are. We then drove to Key West, in search of clear warm water. We went to the places where we were told snorkeling was the best. We tried those beaches on different days and at different times of the day, but found all disappointingly cloudy. The only exception was when we took an excursion to the Dry Tortugas US National Park. It is an island that is 70 miles off shore and required a two-hour boat ride to get there. The snorkeling was exceptionally good but ended too soon. Much more time was spent on the boat than in the water. We should have camped overnight on the island, even though our worst camping trip was on an island. Every day while in the Keys, we would go to John Pennekamp Coral Reef State Park because of its reputation of having great snorkeling. The boats going out to the shallow-water, coral reef of the Florida Keys National Marine Sanctuary; were cancelled because of jelly fish. We snorkeled in the bay with the mangroves and back at our hotel on Islamorada. Since the snorkel boats were not going out, we eventually took their glass-bottom boat to the coral heads. They would have been very inviting had it not been for the thousands of jelly fish, and the many thousands more stinging pieces of jelly fish, which had been torn apart by boat propellers, and were still floating in the water. Our trip was cut short by the unexpected death of my mother in Oak Cliff on a Tuesday. We started our drive home, so that we’d be there when her ashes arrived. We only half unpacked the van knowing that we’d be taking her to New Mexico. Her box arrived on Friday. We planned to leave Tuesday to avoid driving during Memorial Day weekend. Sunday, I spent the morning in the pool reading scripts, so I could finalize my season show choices for my adult and youth theater troupes. It was September 4, 2011 and the day the Bastrop Texas Wildfires started. It would be many months before I would swim again. We spent September and October in shock and sadness, and trying to clean up after the fire. We were saddened discovering what our home insurance did not cover, the outrageous prices being bid to fix things we could not, and that we would never be able to build back what we had. We were further sadden by the enormity of the loses our friends and our community experienced. When I could not take another day of crying, we started on our delayed trip to New Mexico to see my grandfather and my uncle, both sick with cancer, and my aunt. Mom’s ashes rode with us. We rented a vacation house in Aztec, New Mexico. It was an hour away from family but allowed us to bring our dogs. The owner was ironically a retired insurance claims adjuster. He stayed at his condo while we stayed in the home he built. It was on a creek feeding into the lovely Animas River. It was a wonderful place to start healing; watching the water and the animals it drew to its shores. Days were spent doing insurance paperwork while looking out the back windows, days spent with relatives playing bridge and listening to stories, days spent hiking along the creek and river banks, days spent watching the snow arrive, and doing more insurance paperwork. The river, too cold to swim, would stay that way even come summer as it was fed by the snow runoff upstream. We moved on. Our 15-year-old daughter Rachel said, “Since I can’t be home for Christmas, I want to be where it snows.” Having been born in Austin, she’d had little experience with snow other than to visit it on three ski vacations. I researched lift tickets and chose Vail’s package, since it offered five ski resorts in Colorado within an easy drive of each other, thus increasing my chances of finding some place to stay that was dog friendly. We arrived late at night and awoke the next morning to see the picturesque Lake Dillion across the street. We walked the dogs there every day for a month. We watched the water freeze over. We skipped rocks on the ice-covered lake and were amazed by the sounds they made. We left the living room and dining room curtains open all the time to enjoy the beauty of the lake and mountains. We gave ourselves ski passes as an early Christmas present. When we were not filling out insurance reports, creating our contents list, or looking at real estate websites, then we skied on frozen water on five mountains, at Keystone, Vail, Breckenridge, Beaver Creak, and Arapahoe Basin. We thought about staying longer, but I couldn’t find another dog-friendly rental for January in the area. Summit County was a nice place to heal, but we could not stay there. Someone said there were only three outdoor pools in the whole county. The snow-run-off lake was there to quench the Denver’s thirst, not to swim. Our ski passes also included the Northstar and Heavenly in the Lake Tahoe area in California, so I looked for a vacation rental there. We found that it was cheaper to stay in Tahoe, than to return to Austin. That was unexpected, so I broadened my internet search not just for a temporary rental, but for possible long-term housing. I found we’d been living in a economic bubble; Texas real-estate prices had remained pretty constant or risen, and Bastrop’s home prices had risen due to the almost 1700 families displaced by the fire now searching for a place to live. While in much of the country, housing prices had fallen dramatically. I had an agent unsuccessfully looking for something that could be both home and business for us back in Texas. Bill, Rachel, and I spent many hours searching the internet. In a tiny town in Florida, I found a large historic home that was now a restaurant, but could easily be a theater rehearsal space, wedding venue, and a home. It was close to a spring where people would scuba dive, and prices there were reasonable enough that if the business did well in town, we could later also have a more secluded house in the country. We laughed at the listing of a wonderful historic theater / restaurant / bar / classroom / home for sale at the freezing base of Lake Michigan. If I could just picked up the building and put it down anywhere warm and close to friends and family, it would have made the perfect home business. As a diversion Rachel found inexpensive cottages in Scotland and Ireland, villas in Spain and Italy, and a temporary home in London. Which lead me to discover that I could get a Master of Fine Arts in directing while living in London for two year, cheaper than I could at the University of Texas. I wondered what the water was like in London, cold and cloudy I imagined. I found a listing for a Kona coffee farm that had two houses on it. Eric and Chrystina said they’d consider renting out their Austin home, and coming with us to try farming for a couple of years to see if it was right for them. Our family together again, a ready-made business, two houses, and we could afford it. Chrystina, an art major who had been a barista while in college; and Eric, a creative writing and anthropology major, could start a coffee shop on the property and fill the place with young creative friends. What could be better? The farm was in Hawaii and close to the best snorkeling on the island! Maybe it was time to finish the journey to Hawaii we started 22 years earlier. Dreams like these were good motivators to keep working on the home-content list for our insurance claim. We called a real estate agent in Hawaii and asked if the farm was still for sale, she said, "Yes." She explained the reason for the low price was that the farm was a lease hold that we would need to keep it planted with a crop, and that we would forever pay rent for the land and never own it. I remembered my great grandfather’s warning to never be a tenant farmer. Yet, between the time we talked to the agent and the time we discovered she was in fact wrong and that the house did have an existing contract on it, Bill had fallen in love with the idea of living in “A Little Grass Shack” and being a coffee farmer in Hawaii. Nothing else sparked his interested or imagination. We packed all our possessions and watched New Year’s fireworks from our Dillon, Colorado balcony. Early the next morning, we headed for California. We spent the night in a hotel in Salt Lake City, Utah, and were standing on a pier on the Great Salt Lake at sunrise the next morning. We crossed over the Bonneville Salt Flats with their strange, other-worldly feel. It was not the place to be for people who loved water, unless we wanted to make a movie about the moon. For hundreds of miles, Rachel would look up from her book or a nap and say with disgust, “It’s still a dessert.” We drove through a lot of dry country made dryer by drought and finally arrived in South Lake Tahoe, California after dark. Our January house was halfway between the ski lifts and the lake. When we awoke, we drove first to the lake. Frisky tugged hard at his leash to get into crystal-clear water. I knew how he felt. It was beautiful. Lake Tahoe looked like a mammoth version of Lake Dillon. Taunted again with, “Water, water, everywhere, but not a place to swim,” we went to see the ski areas. It was hard to imagine skiing when there was no snow anywhere in town. The next day we took a ski gondola halfway up the mountain at Heavenly and skied on mostly man-made slush. The locals in town often apologized for the lack of snow, but we thought it was fun and quite different from the 14-degree days skiing in Colorado. We’d do insurance reports early, and give the ice on the ski runs time to melt. We found by keeping our skis well waxed the slush was enjoyable until around 3 p.m. when it would return to ice. The lower elevation of Heavenly made it easier to breathe than in Colorado. The regular skiers stayed away keeping the lift lines short, and the views were outstanding. We could not be in the water, so we would be on it. 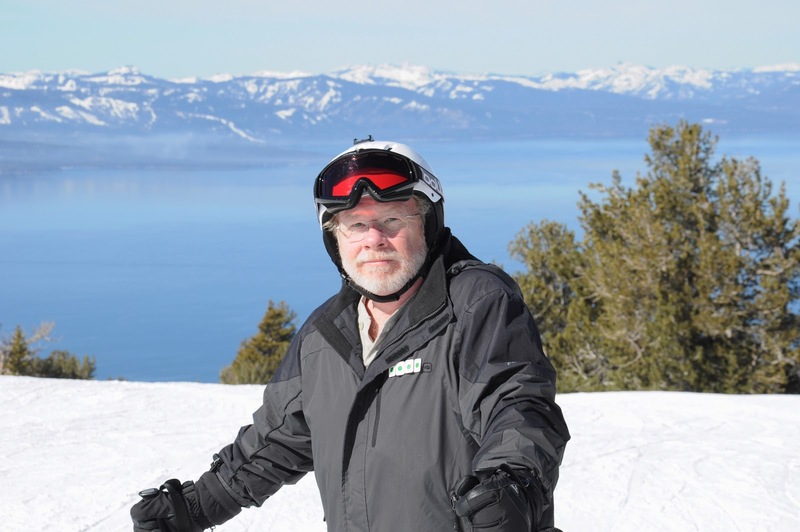 We skied the two California ski resorts that were on our ski pass, Heavenly and Northstar. While we were in Tahoe, Vail purchased another ski resort and made Kirkwood available; so we skied there, too. It was perfect. There were days we skied in our T-shirts; days we skied in a blizzard; a day we skied in rain, and one day we just took off our skis and walked back to the gondola and went home, because the wind was so fierce that we were afraid it would blow us off the mountain. We enjoyed it all. It was a series of firsts. We would say things like, “We've never skied in rain before,” or “We've never skied in fog.” We watched the mountain go from grass to snow, all while the town stayed clear enough that we never had to buy tire chains. More snow meant that the resorts opened new terrain for us to explore and enjoy. Then it began to get warmer, and we watched as the snow melt and waterfalls appear where there had been none, and saw big waterfalls become bigger and more powerful. We hiked, and we sat for hours by the beautiful snow-melt lake and thundering waterfalls. We took lots of photographs of waterfalls, but not one could capture their beauty, scale, and power. Every month we would call our landlord in San Francisco and extend our lease for another month. It was sweet and sour. I will always be grateful to have found a place so beautiful, which made it easy to make short excursions and escape from the computer where we spent so much time looking for a temporary and permanent home, and listing, valuing, cataloging, and categorizing our losses. ﻿﻿Bill and Rachel stayed in Tahoe for four month. I was there for three. I spent one month in Texas directing a show, because I had promised to do so. While there I looked at Texas houses I’d found on line, and I met with builders. I was away from Bill and Rachel longer than I’d ever been away, but I spent time with Eric and Chrystina (my son and daughter-in-love), and many of my friends. I had written a short play in January that won a competition; and I presented it at a conference where I saw more theater friends. Loving friends and family helped with the show, and they reminded me how much they missed us by trying to find a home for us in Bastrop. Before leaving, although done while crying, I was able to throw away the few tiny, burned artifacts and remnants of our life that we had rescued from the ash, that I was unable to part with just months before. None of us had ever experienced six months of winter. Frisky’s fur got longer and thicker than it ever had been in his life. He gained 16 pounds and looked very lion-like. 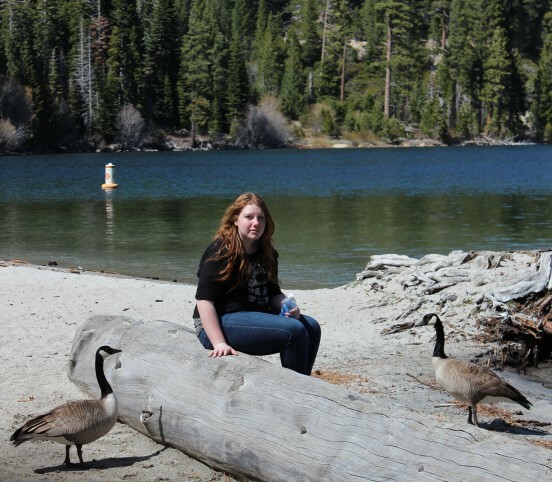 When we left Lake Tahoe, we were all in better physical and mental condition than we were when we arrived. It took some doing, but we arrived in Hawaii, June 7, 2012, that was the first day the dogs were permitted into Hawaii. My world’s pool had been “closed” for a full school year, from September to June. During that time, I learn much about myself, and about what I want and don’t want. We learned things from each house where we stayed. We learned things about the land, about the weather, and about each other. Late afternoon on June 8, I sat on the sharp, black, lava-stone in Hawaii and held Frisky and Toto’s leash, while I watched Rachel and Bill snorkel. Then Bill held the dogs, while I found a precarious path into the water, then, holding Rachel hand, I quietly snorkeled. After 279 days out of the water, it took me only a minute to feel at ease in the water. Kahauloa Bay, Big Island of Hawaii 2012 The white speck on the distant shore line is the Captain Cook Monument. Twice I've been frightened in Hawaii, once in Kahauloa Bay when I thought there might be a shark headed toward Bill and Rachel, and once when our dog, Frisky, was lost for an hour. We celebrated Bill’s 52nd birthday and our 30th wedding anniversary in Hawaii. Our possessions still fit into our van. We’ve now taken our Lake-Tahoe-made list of homes and driven by the few Kona coffee farms that are for sale. They are similar to the one that started Bill dreaming, but never asked to looked inside, because we have now experienced the vog (volcanic smog). The idea of growing organic coffee beans for others while breathing dangerous levels of sulfur dioxide and poisons thrown off by the volcano does not make any sense to us. When my face is in the water, it is too easy to forget why we should not stay. At this point, we have driven three fourths of the highway around the island. We have enjoyed it. We wear shorts or bathing suits almost all the time. The house has no air-conditioning or heating and we haven’t missed either. We’re barefoot in the house like we were at home; but we have to wear shoes outside, because lava rock hurts. To see Bill's video of this dolphin snorkel click here. Quick update as of 12/12/2015: Two years and one day after the swimming with the dolphin above. We were living in Bastrop, Texas in a rental house almost within sight of our burned home. I found a brand new listing for a lease-hold coffee farm, on the ocean side of the street, on the street we loved (the one with the original coffee farm that had started us dreaming), within sight of the Captain Cook Monument, and an easy drive to Two Step, our favorite snorkeling spot in the world. Our home is now that coffee farm in Hawaii which has for the last 30 years has been called Engel Farm, so it seems that it was meant to be ours. I'm teaching theatre to teens at the local community theatre, and a part-time 1st grader teacher. Bill actively farms everyday and loves it. We call the business Kona True. The dogs are still with us. We miss my son Eric, Chrystina, and our grandson. I miss my Texas theatre company, friends, and family. But Rachel decided to join us at least for a little while. Another update as of 1/25/2018: We are in our third coffee season here on the Kona True farm. We are doing everything organically, which makes it much more difficult and the crop is much smaller than what we would get if using chemical fertilizers. Our first two season here, we only sold the cherry to another farm to process. This year we purchase the processing equipment, and we're selling our coffee on our website. We entered our first batch in the 2017 Kona Coffee Festival cupping competition. We were thrilled to be a finalist in the Artisanal Division: Heritage Profile. Kona True website. Rachel is swimming with her boyfriend of over a year, and is a barista. Eric and Chrystina and two grandsons returned home after spending a couple of months with us. Both dogs are lying at my feet as write this. Frisky is now over 15-years-old. He's still beautiful, but we have to help him get up. Toto is a little grayer, but just as loving.